The Amritsar (Rural) police has busted a five-member gang of robbers allegedly planning to commit a robbery near Udhonangal village here. Coming clean on its plan to transform the 143-year-old Town Hall complex into a mega tourism destination. As many as three miscreants robbed Shivam Nanda, a resident of Green Avenue area of his mobile phone today. The accused were armed with sharp-edged weapons. The city police has nabbed two persons who were allegedly involved in looting and snatching incidents in and around the city. In another haul of fake currency from Pakistan, the 199 battalion of the Border Security Force seized Rs 2.73 lakh of counterfeit currency notes from near Indo-Pak border fence here. Sidewalks are vanishing from the city map thanks to the growing businesses of some vendors. The district health authorities have failed to remove the carcass of a dog from its office premises even after three days. The carcass has been lying in a corner of the workshop compound of the Civil Surgeon’s office. Deputy Commissioner, Amritsar, Rajat Aggarwal, convened a meeting of the District Task Force for Polio control at Circuit House today to review the arrangements for the National Immunization Days from February 19 to 21. 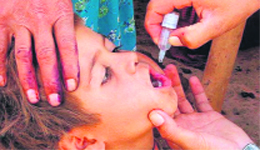 A child being administered Pulse Polio vaccine. Akal Takht Jathedar Giani Gurbachan Singh today released ‘Introduction to Sikhism’, a book penned by 13-year-old Bikramjit Singh Bains hailing from Canada. A three-member peer team of the National Assessment and Accreditation Council (NAAC) of the UGC presented its report to the V-C of GND University Prof AS Brar after its three-day format inspection of the Academic Staff College (ASC) of the university. An athlete from the Khalsa College for Women (KCW) Khushbir Kaur, who had set a new national record in five-km walk event recently, has cemented her positioning for the pre-Olympics camp to be held in Japan next month. Guru Nanak Dev University will distribute scholarships to meritorious and needy students on February 19. The programme will be organised by the Nishkam Sikh Welfare Council in association with Sikh Human Development Foundation, America. Right to property to women, honour killing, female foeticide and others issues were discussed during a seminar on ‘Women enlightenment’ organised by Women Enlightenment Forum of BBK DAV College for Women today. The police seized a country-made pistol, sharp-edged weapons besides 500 gram of narcotic powder from their possession. A case under Sections 399 and 402 of the IPC, Sections 25, 54 and 59 of the Arms Act and Sections 21, 61 and 85 of the NDPS Act has been registered against them at the Mehta police station. The accused include Gura Singh of Rayya, Gurkhalsa Singh of Mehrampur Khurd, Joga Singh of Chhanake Khurd, Santokh Singh of Chhananke and Rashpal Singh of Mehta Chowk. Lakha Singh, SHO Mehta police station said as per preliminary investigations all the accused are acute drug addicts and they were hiding at a stadium in the Udonangal village when they were caught after a tip off. The police has recovered a sharp-edged weapon and 100 gram of narcotic powder from Gura Singh, 200 grams (narcotic) powder from Gurkhalsa, a dagger and 100 gram of narcotic powder from Joga Singh, while another sharp-edged weapon was seized from Santokh Singh and a pistol and 100 gram narcotic powder from Rashpal Singh. Lakha Singh said Santokh were wanted in an attempt to murder case registered in December last year in a case of cross-firing, which was registered against both the parties. He said further investigations were under progress to find out their involvement in looting instances in and around Amritsar. He said they were produced in the court and taken on police remand for further probe. Coming clean on its plan to transform the 143-year-old Town Hall complex into a mega tourism destination, the Amritsar Municipal Corporation had scrapped the notion that it will be reshaped to suit any commercial venture. This site gained attention following a petition filed by a local NGO with the Punjab and Haryana High Court that this historical site is being put in use as a commercial hotel and shops by 'demolishing and tampering' with this heritage building. The HC had directed to observe a status quo motion for any modification with the structure while taking into account some need-based alterations which were being conducted then, following a pact between the AMC and the Punjab Heritage Tourism Promotion Board, to suit the proposal of making it as a tourist site. However, the court has allowed conducting any repair or renovation of the century-old building because of its age. The AMC officials submitted before the court yesterday that no idea was in place converting it into a hotel and that the historic importance of the site would be conserved at the first instance. As per plan, the Town Hall building will be transformed into a multiple tourist site which will have an underground museum spread over 5,000 sq metre area to showcase articles pertaining to Punjabi cultural heritage in general and Amritsar's historical significance in particular. Besides this, there will be a well stocked library with rare books. It has been learnt that in the first phase, Rs 9 crore will be spent just to conserve the building, yet the decision of having a food court or café here has been revoked, for the time being. 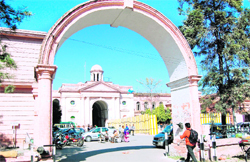 The pink, U-shaped Town Hall complex was lately being used to run the offices of the CID, the police department and the Amritsar Municipal Corporation (AMC). The CID and the police office has already vacated the major portions which were under their possession, likewise the AMC too will be shifted its office to a new location at Ranjit Avenue. Being strategically located near the most visited holiest shrine-the Golden Temple, the Town Hall site will be an apt destination for tourists. AMC Commissioner Dharmpal Gupta said everything will be done as per the directions of the HC. "The historic significance is our prime concern. The site will be put to reuse in such a manner that its historic value should prosper. At present, there is status quo on the issue,” he said. Though, the new concept will be taken care of by the Archeological Survey of India (ASI) yet the revenue proceeds from the adaptive reuse of Town Hall will come back to the AMC. "This amount will again be ploughed back into Amritsar's development projects," he added. The Town Hall is a two-storey building measuring 181X 86.9 foot. It is made up of red burnt and grinded bricks having a ceiling supported by wooden rafters or beams. Before 1852, it housed the residence of Rani Sada Kaur, mother-in-law of Maharaja Ranjit Singh. In 1857, after annexation of Punjab by Britishers, one of their primary action was to demolish the robust outer fortification. In its place, this building was converted into the first Municipal Committee of Punjab and the offices of city Kotwali (police), treasury branch and the district administration. The tradition continued. y During British rule, people would gather every evening here to relax and enjoy the music played by live bands in the Town Hall grounds. Its central tower was brightly lit at night. In the early 20 th century, an expansive public library was established on the premises. Later, renamed the Moti lal Nehru library, it continued to wield a significant presence today also. As many as three miscreants robbed Shivam Nanda, a resident of Green Avenue area of his mobile phone today. The accused were armed with sharp-edged weapons. The police has lodged a case under Section 394, 34 IPC at Civil Lines police station in this regard. Shivam alleged that he was standing outside a restaurant near Vishal Megamart in Ranjit Avenue area when the accused, who were armed with sharp-edged weapons, attacked him and fled with his mobile phone. In another incident, two unidentified youth snatched a purse from Rupinder Kaur of Kot Khalsa when she was on her way home. She said when she reached near Guru Nanak Dev University, the motorcycle-borne youth came from behind her and snatched her purse. She had two mobile phones, a PAN card and several other documents in her purse. Two more incidents of snatchings were reported in the area. Amarjit Kaur, a resident of Madhu Saga village in Ajnala, was robbed by the same person near GNDU. She was going for her admission to the university at the time of the incident. She was carrying a mobile phone, some cash besides certificates and important documents in her purse. Sharanjit Kaur of Guru Ki Wadali was looted near Khalsa College, a couple of kilometers away from GNDU on the main GT Road, while she was coming out of the bank. She had two mobile phones and Rs 1,550 in cash in her purse. In all the incidents the accused were riding motorcycles of Bajaj Pulsar make in black colour. The victims could not notice the number of the motorcycle, said Kuldip Singh, in charge Mahal police chowki falling under Cantonment police station where a case under Section 379-B has been registered in this connection. The accused have been identified as Rajinder Singh alias Raju of Jora Fatak, Rasulpur Kaller and Mohni of Maqboolpura locality. A case under Section 382, 34 IPC and 20/61/85 of the NDPS Act has been registered against them at B-Division police station in this connection. The police has also seized 500 gram of charas, a motorcycle without number and a purse from the possession of Rajinder Singh. Rajinder Singh was the main culprit in the crime while Mohni had been lured by him and a new entrant in the crime. He was wanted in the four cases of lootings and snatchings registered at various police stations in the city and adjoining areas besides Jalandhar. In 2009 he had managed to escape from custody by throwing red chilly powder into the eyes of the police constables. A case was also registered against him. The force seized 79 notes of Rs 1,000 denomination while remaining 388 notes were of Rs 500 denomination. The BSF authorities handed over the fake currency to Gharinda police which registered a case under Section 489-A,B,C of the IPC against two persons Bachitar Singh and his brother Beant Singh, both residents of Daoke village. The recovery was made near Bharowal border post where the contraband was hidden under ground near a canal. Sources said the accused were booked after their suspected movements in the area where the fake currency was seized. They said further investigations were being conducted to find out the source and the border point from where it was smuggled into India. The small shops have encroached upon the footpaths, which were constructed to ensure safety of the pedestrians. The Queens road, for example, is one of the busiest streets of the city and the footpaths here are covered with small shops selling car accessories. People cannot walk on these sidewalks and walking on the road is definitely not out of danger. These shopkeepers not only use the sidewalks but also a part of the road. Mechanics use roadsides to fit accessories in the cars, which means parking area is also often use by them to run their businesses. Foreigners who visit the city find it very difficult to walk on the busy streets in absence of proper footpaths. Daljinder Singh, a student, said, “The shopkeepers display goods on the footpaths leaving no space for the people to move from one shop to another.” He said roads in the shopping areas without proper footpaths are very unsafe for the pedestrians. 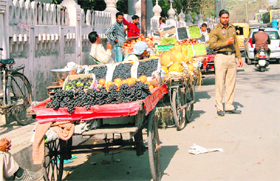 Fruit sellers have almost blocked the sidewalks at Hukam Singh road, outside the Company Bagh. Sunil Kumar, a pedestrian, said, “The fruit sellers must be asked to set up their shops in the near by rhehri market.” Garbage dumps on footpaths also cause problems for the pedestrians, like the road outside Alexandra School. The employees working at the premises reported that they had first seen the carcass two days ago. Sweepers working at the Civil Surgeon’s office dragged it to a corner rather tan disposing it of at a suitable place. A driver with the health department said: “The carcass will start emanating foul smell in a day or two.” The area where the carcass is lying is used to park official vehicles. The office cafeteria is also a stone’s throw from the spot. During the meeting Aggarwal took stock of the various arrangements made by the district health authorities to conduct the polio immunisation drive successfully. He said more than 3, 37, 420 children in the age group of 0 to 5 years will be administered polio immunisation drops. The health department has planned to set up 1,492 polio booths at the various locations. Civil Surgeon Dr Manjit Singh Randhawa said 2,890 teams will be deployed at these booths. The department has also planned for mobile teams which will administer polio drops outside Attari International Checkpost, Guru Ramdas International Airport and various religious places in the city. On the first day of the campaign, polio drops will be administered at the booths while on the later two days, a door-to-door polio campaign will also be conducted. Aggarwal said people must cooperate with the volunteers and employees administering polio drops so that each and every child is covered. He called upon the NGOs and other social organisations to lend a helping hand to the authorities for successful immunisation drive. The Deputy Commissioner also asked government and private schools in the district to cooperate with the polio immunisation teams. Akal Takht Jathedar Giani Gurbachan Singh today released ‘Introduction to Sikhism’, a book penned by 13-year-old Bikramjit Singh Bains hailing from Canada. Showering praises on the teenager, the Jathedar said there is a dire need to acquaint the new generation with all the aspects of Sikhism in various languages and by writing a book on the topic in English Bikramjit has done a commendable job. He also felicitated the teenaged writer by presenting a ‘siropa’ to him. Bikramjit said he drew inspiration to write this book from his grandfather. The members of the visiting team included Dr Satish Verma, Prof PS Jayaramu and Prof JP Pachauri. The committee also interacted with the Registrar Dr Inderjit Singh; Dean Academic Affairs Dr Rajinderjit Kaur Pawar; Dean College Development Council Dr MS Hundal; Director ASC Dr Satish Verma and members of the Advisory Committee and Finance and Development Officer. The committee also had deliberations with the principals of 10 colleges and interacted with 30 resource-persons and 60 teacher-participants of refresher courses. Presiding over the exit meeting, NAAC Peer Team chairman Prof Bhoomitra Dev appreciated the achievements of the GN D University over recent years. He said though Academic Staff Colleges of the universities play a vital role in training teachers but to impart quality education there is a dire need of world-class infrastructure and highly-trained teachers. Those present at the review report presentation included Dr AK Thukral, Director Research, Dr Inderjit Singh, Registrar Dr Satish Verma, ASC Director Prof RK Mahajan, professor in charge (examinations) and members of the Advisory Committee and other university officers and staff of the ASC. She was undergoing trials at the National Institute of Sports (NIS), Patiala, where she qualified for the camp that will train her for London Olympics to be held by the year end, KCW principal Dr Sukhbir Kaur Mahal said. “Khushbir is happy and so are we over her achievement. She is basically an Olympics material and her goal is to represent the country in the world event,” said Dr Mahal. They will honour her on her arrival here. She will be contesting the 20 km walk event and her present timing has been recorded at 1 hour 37 minutes and 46 seconds, which got her selected. “The selection has definitely boosted my morale and confidence. It is great to inch ahead towards the Olympics,” said Khushbir. The BA first year student Khushbir said, “I worked hard on my timing and will improve further under the able-guidance of the coaches in Japan, where I will be heading early next month. Hailing from a lower middle class family, she had got her inspiration from her widow mother who despite all odds helped her to achieve big in the field of sports. Having won a number of honours, she won the gold medal in the 20 km walk event in the Open Indian National Athletic Championship held at Kolkata recently. She completed the walk in 1 hour 45 minutes and 38 seconds. Her timing in the five km walk is 24.31 minutes in the inter-colleges athletic championship, held at Guru Nanak Dev University. Her earlier record in the 10 km walk was 49.21 minutes and she had won the gold medal in the 5 km school national walk held at Pune and silver in the Asian Games held at Singapore last year apart from taking part in the youth Olympic Games. Dr Inderjit Singh, Registrar of the University, would be the chief guest on this occasion. The Electronics Department of Guru Nanak Dev University won the Inter-Departmental Hockey Championship by defeating Computer Science and Engineering Department. The score was 1-0. These competitions concluded last evening at the Hockey Stadium of the University. Seven teams from various departments participated in this competition. Prof PK Shejpal, Dean, Students Welfare, was the chief guest and distributed trophies to the winners. Computer Science and Engineering department came second and Pharmaceutical Sciences department finished third. Minister of Women and Child Welfare Lakshmi Kanta Chawla, who presided during the seminar, in her address elaborated on the rights of women. She inspired the students to be an enlightened person who is aware about society and country. She said in order to develop capability one must be aware of one’s rights.